Please note that our Amazon store is no longer available as Amazon no longer supports astores. We are now offering our Recommended Resources through other posts (see recommended resource categories) and pages (like Recommended Resources) on our site where you can find the direct links to the products on Amazon. The links below to the products have been updated for you as well. We have recently updated our Musical Toys for Babies and Toddlers. We’ve added some new instruments, crib toys, activity gyms, and fun musical bath toys for toddlers. 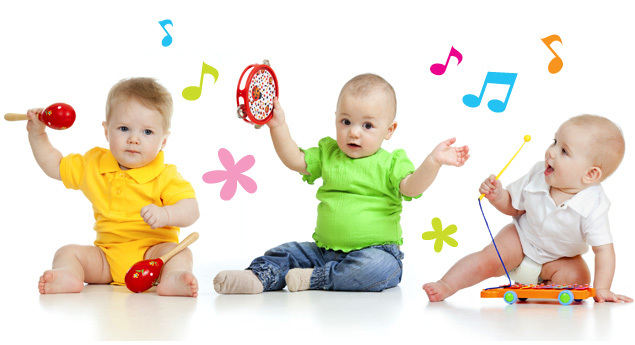 We’ve added some of our favorite quality music instruments which are appropriate for babies and toddlers. These instruments make pleasing sounds, are sturdy, and safe! Make sure to always monitor your baby with toys that he will put in his mouth. Some of our favorite brands are Remo, Hohner, and Latin Percussion. These fun animal shakers are easy to clean and sound great! Most of them we have personally experienced and recommend. From our favorite Sleep Sheep (which now comes in lots of different animals like this cute owl) to our favorite activity gym to our newest addition: musical instruments to play with in the bath! If you haven’t read our Sleep Sheep review, check it out! My two year old opened this bath tub symphony on his second birthday! He opened them and started playing with them right away. He wasn’t into taking baths but with these fun toys he was a little more motivated. Now he enjoys bath time and the fun music he can make! They all float and come with two mallets/drum sticks, along with song cards to teach simple well-known songs (which stick to the bath tub wall which is fun). You can fill the flutes with water, each with a different amount, to make a quality sound. 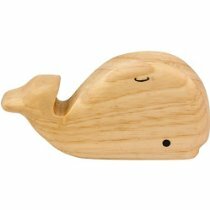 This little guy from Green Tones was recently discovered as we have been preparing our baby registry for baby #2 (due in May). We haven’t tried him out yet but I liked what I read about it as well as the positive reviews. This is one of the fun activity mats that our first son used. Its great because the music is fun and pleasing (sort of a jazz sound to it) and it can be use two ways. Lay baby down with feet in reach of the piano while he plays with the hanging toys and kicks to make music, or turn the piano up like a little table and have baby sit and play with his hands. That was just a sampling of some of the new products we added to our recommended musical toys list. 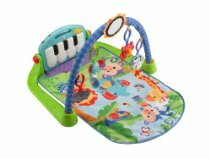 What are some of your favorite musical toys for babies and toddlers? 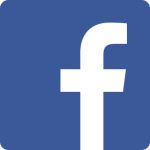 Share with us over at Facebook or in the comments below!